1 In this room a star piece leads the palette and the blue is then echoed by various complementary shades around it. Note an almost matching colour on the wall, a deeper tone on the window and woodwork; then moving into a smoky blue grey fabric for the curtains. Dark wood on other pieces, and the floor, work perfectly with these tones and also keep the look tight and coherent. Adding in another lighter wood would have been a distraction for the eye and spoilt the scheme. 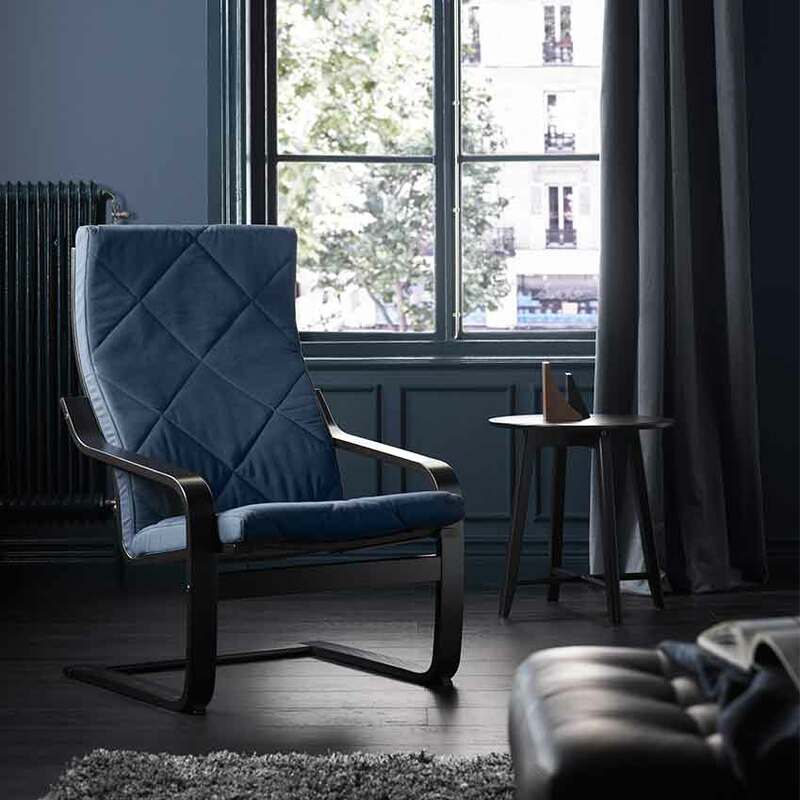 The ‘Poång’ easy chair from IKEA is still as popular today as it was when it was created in 1976 by Japanese designer Noboru Nakamura, with 1.5 million sold globally every year. 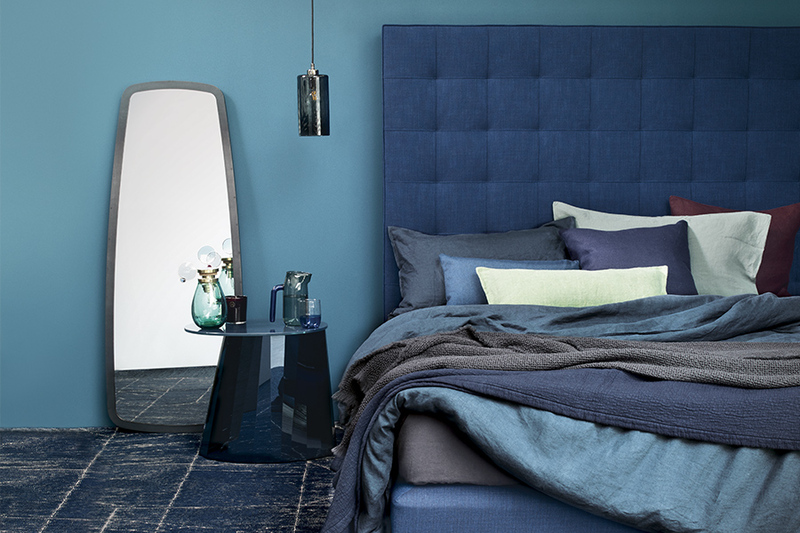 2 Blue works wonderfully well as layers Here the rich shade of the headboard is mirrored by the rug, and then lots of shades in-between, from a dark duck-eggy blue to deeper slate blues and even a pop of celadon, complete the picture through the linens. Coordinating the shine of the mirrored glass side table with the glass pendant light is a perfect finishing touch. Bedroom Styled by Sania Pell. Photograph: Beth Evans. First featured in the November ‘Bedrooms’ edition 2016. 3 Here the star piece is the palette This room could have been rather humdrum were it not for the wonderfully ornate and original tiled floor. 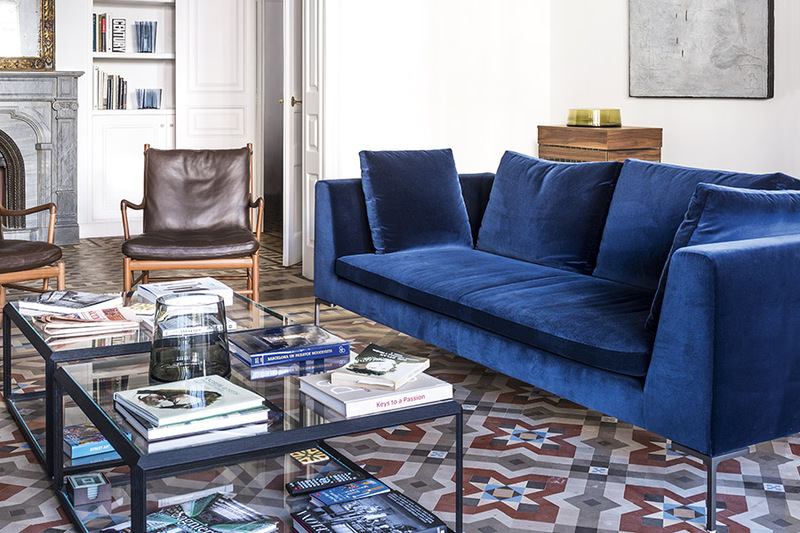 But rather than let it rest on these laurels alone, the homeowners cleverly picked up on the blue in the tiles and upholstered the sofa to match. It works in the same way as someone with blue eyes finding them accentuated if they wear a blue jumper too! 4 Heavenly blues: The dream scenario. 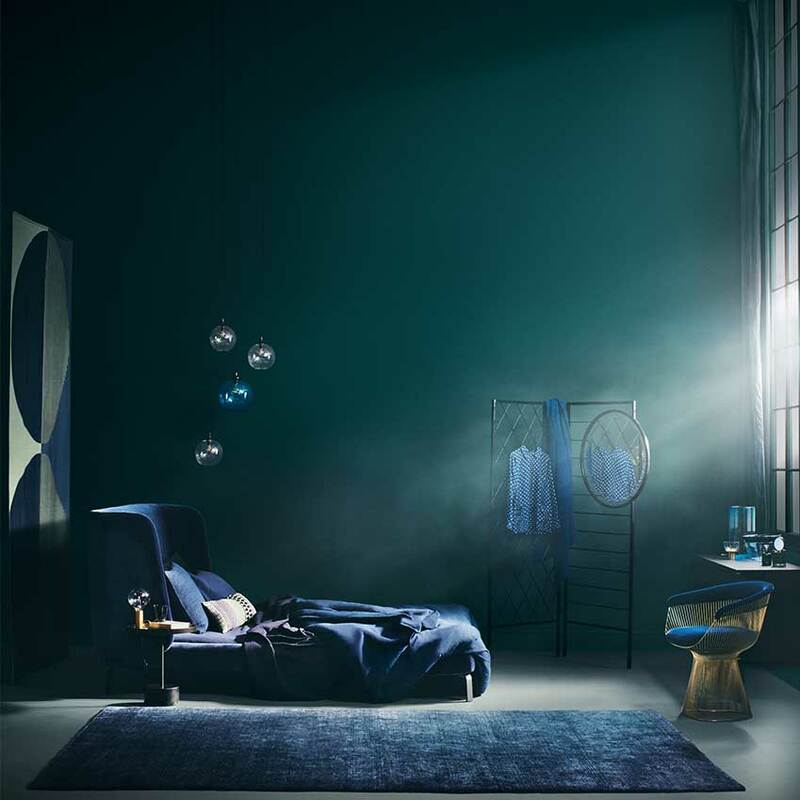 In this blissfully moody blue bedroom, the bed is the statement but it’s emphasised by fully-coordinating linens, floor-coverings and furniture. And using a teal-toned colour on the back wall gives it the lift it needs. If the same blue had been used here too, the room would have lacked depth and warmth. Bedroom styled by Sania Pell. Photographer: Beth Evans. First featured in the November 2016 ‘Bedrooms’ issue. 5 Blue has the ability to be both classic and casual, also very Scandinavian, or Dutch while also recalling American beach houses! It truly is the ultimate multi-cultural colour. 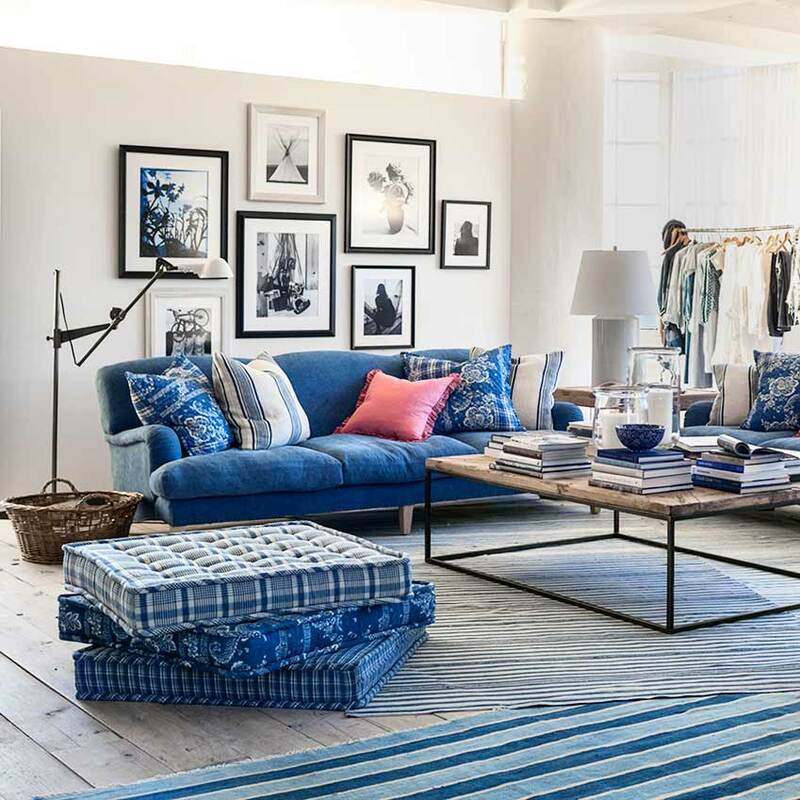 Denim-esque fabrics and flat-weave rugs add to the effect. As do details like pin-tucks, buttoning, stripes, prints and Chesterfield sofas. All products from Ralph Lauren Home. 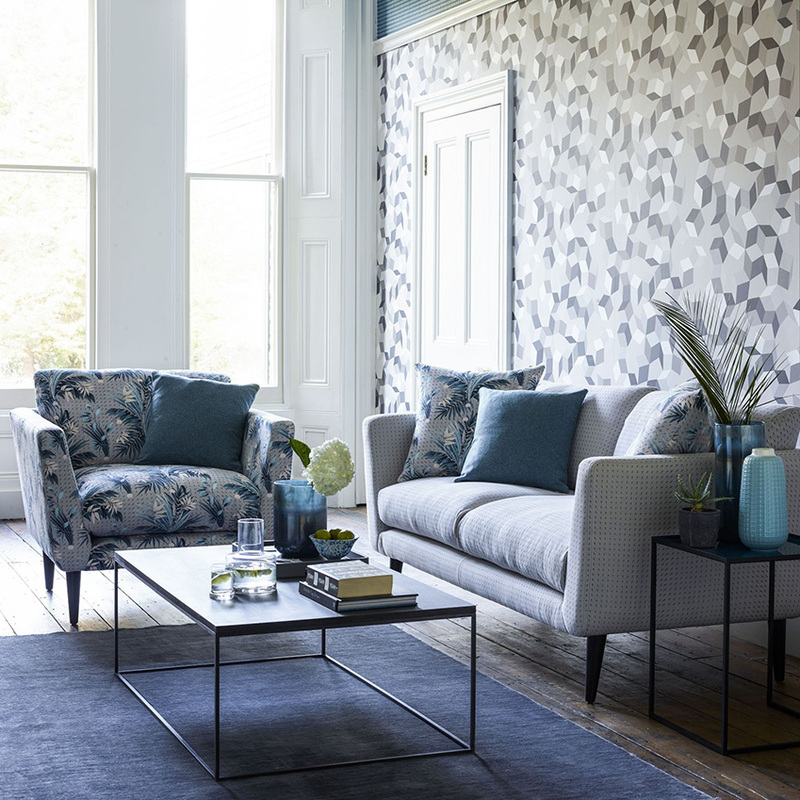 6 But blue can be subtle too Here, used against a base of grey, the blue rug literally grounds the scheme, its tone springing up in sprigs of flowers on the armchair print, which crosses to the cushions and is complemented by an assortment of table accessories. And where most of us wouldn’t contemplate introducing another print into this scheme, the one on the wall actually really works. 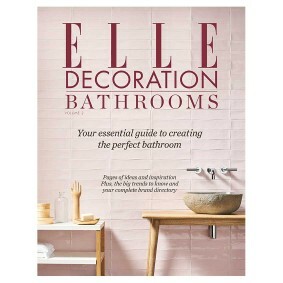 But only because its graphic print is confined to shades of grey, rather than blue. 7 Never forget your ceiling. In the showroom of Sicis, the Italian glass mosaic maker extraordinaire, a deep blue ceiling is a wonderful touch. 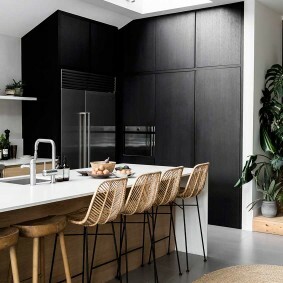 Far from making the room feel small, it accentuates it’s lofty proportions, recalls limitless skies and perfectly echoes the blue velvet upholstery used in the room as a whole. A brilliant trick to try at home, if you dare! Sicis showroom, 15 Dover Street, Mayfair, London W1.